It is with some relief that this project is now concluded. After a long gestation period starting in late 2011 ‘production’ really kicked in early in December 2012 and only now in January 2013 can the project be put to bed. 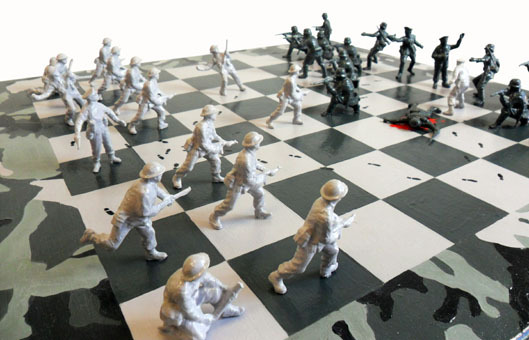 It started out as simply plastic toy soldiers taking the place of chess pieces in a game of chess. 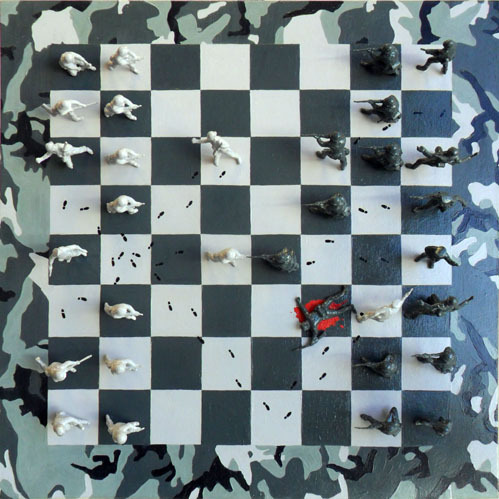 I liked the fact that chess loosely symbolised military strategy and the figures themselves symbolise soldiers of war. I wanted the finished piece to be displayed vertically to place it as art rather than a model/sculpture and I wanted it to retain characteristics of a painting rather than become an exercise in precision model making. I started by working out which game I wanted to depict. Something with few moves, so that showing the ‘footprint’ journey of each of the pieces would not be too confused. ‘Fools mate’ was the one I had heard about, but aesthetically it didn’t work – and no dead bodies! In my research, I found scholar’s mate which was simple but dynamic when depicted in my language of soldiers. Next issue was obtaining toy soldiers for use on the board. Ultimately I used WW2 German infantry versus WW2 British infantry from Airfix at scale 1:32. Each box contains an assortment of figures, which I had to re-categorize as Pawns, Bishops, Rooks etc; trying to keep the relative sizes as their chess piece equivalent. I needed enough boxes to achieve 8 identical pawns. I had the officer class playing both King and Queen; so I altered two of these figures, one to depict surrendering German King, and the other the victorious British King. The other altered piece was the vanquished German pawn, which was made from various parts of other figures. These figures dictated the size of the individual squares and therefore the 50 cm overall size. I used nails as spigots to connect the legs of the soldiers into the board. Their plastic bases were removed and I drilled into the legs with a small drill bit. This was pretty tricky as the drill would either melt the plastic or come shooting out the side of the leg, or more often than not both. You will notice on close inspection that some of the feet of apparently identical soldiers are pointing in different directions. This doesn’t really bother me as bit adds to the hand crafted feel. Right up until the start of painting, I was planning a colourful affair, where the pieces were slightly different colours from the squares, and each path of footprints were coloured differently too to define an order of creation. I’d even considered having small patches of green felt on the bottom of visible boots like those used in some chess sets. Only after my wife suggested camouflage for the surrounding pattern did the present ethos finally take shape. I narrowed the colour palette right down to mimic a camouflage – suitable for desert warfare I believe. The red blood splat only returned from being the greeny gray right at the end for compositional reasons. The number of coats of paint on the squares seemed endless. But at last I am happy with the level of neatness and the use of semi- gloss and gloss varnishes. Finally I can tidy the office and return to some sense of normality!